206 results. Displaying results 41 - 60. Preserved and cased Roach, caught by Mrs R. Paton, in the River Thames at Tadpole, on the 8th August 1913. Weight 2lbs 9ozs. ROACH Latin Name - Rutilius rutilus Colour - Roach varies in colour but usually the back is dark bluish green, its sides are blue or silvery and its belly is white. Its dorsal (back) fins are greyish brown and the other fins are reddish. The iris of its eye is red. Size - Roach usually weigh about 500g (11lb) and are 15-25cm (6-10in) long. Characteristics - A roach is a member of the carp familiy and can live for 12 years. Diet - It eats both animal and plant material. In the winter it feeds less and during sawning (production of eggs) it does not feed. Habitat - Roach live in slow flowing rivers and in shoals (groups). Is is one of the most common fish found in the Thames. How fished for - It is a popular fish for anglers and can be caught with maggots and worms and usually by float fishing. Interesting Facts - The roach is one of the easiest fish to age by the pattern of growth rings on its scales. 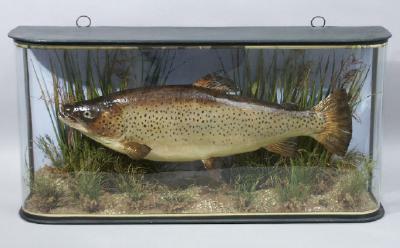 Preserved and cased Thames Trout fish, caught by AE Hobbs in the River Thames in the late 19th or early 20th century Hobbs was born in New Street, Henley in 1871 and lived in Henley all his life. Whilst working as an architect for Brakspear brewery in the 1930's he was responsible for designing many local pubs. Hobbs claimed to have caught almost 900 Thames Trout, each over 3 lbs in weight, in 55 years of fishing. He fished in the non-tidal reaches of the Thames. BROWN TROUT (When found in the Thames these are called Thames Trout) Latin name - Salmo trutta Colour - It is usually brownish or greenish with a darker back but the colour is variable. Greyish blue specimens occur and some are almost black. Size - Growth is dependent on the surroundings and adults are often between 20-50m long. Trout can grow up to 140cm (55ins) long. Charcteristics - The trout has many black spots on its head and body and some red spots. Its lower jaw is long and in old males becomes hooked. The younger trout are called parr and have around 10 marks (called parr marks) on each side of the body. Habitat - The trout likes clean rivers which are high in oxygen. Diet - It feeds on invertebrates, fish and crustaceans. How fished for - Trout are today more often caught from stocked lakes than rivers such as the Thames. 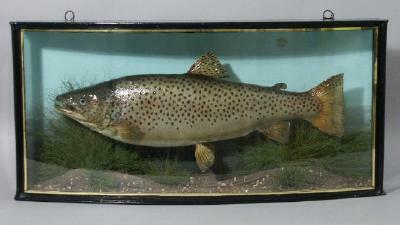 Preserved and cased Trout fish, caught by AE Hobbs in the River Thames on the 29th June 1895. Weight 7 lbs 12oz. Hobbs was born in New Street, Henley in 1871 and lived in Henley all his life. Whilst working as an architect for Brakspear brewery in the 1930's he was responsible for designing many local pubs. Hobbs claimed to have caught almost 900 Thames Trout, each over 3 lbs in weight, in 55 years of fishing. He fished in the non-tidal reaches of the Thames. 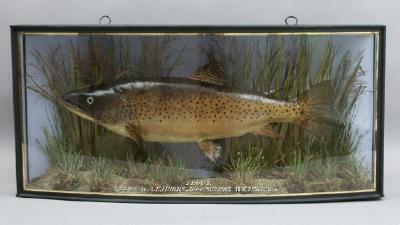 TROUT Latin name - Salmo trutta Colour - It is usually brownish or greenish with a darker back but the colour is variable. Greyish blue specimens occur and some are almost black. Size - Growth is dependent on the surroundings and adults are often between 20-50m long. Trout can grow up to 140cm (55ins) long. Charcteristics - The trout has many black spots on its head and body and some red spots. Its lower jaw is long and in old males becomes hooked. The younger trout are called parr and have around 10 marks (called parr marks) on each side of the body. Habitat - The trout likes clean rivers which are high in oxygen. Diet - It feeds on invertebrates, fish and crustaceans. How fished for - Trout are today more often caught from stocked lakes than rivers such as the Thames. 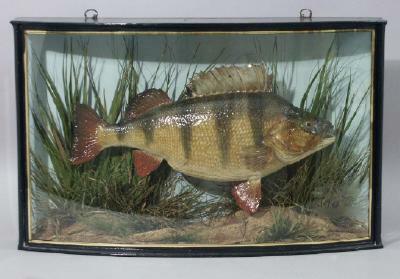 Preserved and cased Perch, caught by G. King at Sanford on Thames on January 26th, 1900. Weight 2lbs 8ozs. PERCH Latin Name - Perca fluviatilis Colour - Its flanks (sides) are pale green with dark bars ruiniing from the back. These bars vary in colour and number from 5 to 9. Its belly is silvery green. Size - This depends what food isavailable. Adults are often bewteen 15cm and 30cm (6-12 inches) and weigh up to 2kg (4/5lb). Characteristics - Its dorsal fin (on its back) is grey with a large dark spot at the back. Its second dorsal fin is yellowish. Its pectoral fins (on its side) are brown. The other fins and the tail are pink, orange or red depending on its age, the time of year and the water in which it lives. Diet - It eats small fish either dead or alive, crustaceans and molluscs (animals in shells), insect lavae and worms. It is not fussy and will eat most living creatures that it can. Habitat - The perch likes slow flowing rivers, like the Thames, and lives in large shoals (groups). It avoids cold quick waters. How fished for - Anglers use live or dead fish as bait such as minnows and gudgeon but also worms or maggots or artificial baits called lures. Many anglers catch perch by float fishing but in deep water ledgering is used. Ledgering involves the use of lead weight to keep the bait near to the bottom of the water. 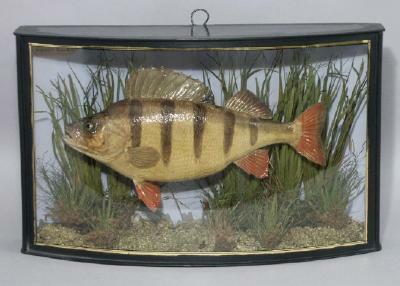 Interesting Facts - One of the perch's favourite food is its own fry (baby perch) British Record - 2.52kg - 5lb 9oz Preserved and mounted by J Cooper & Sons of London. 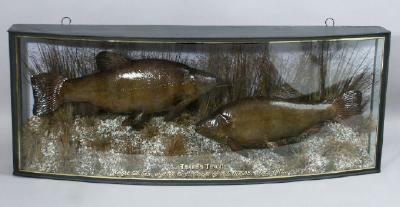 A pair of preserved and cased Thames Tench caught by AE Hobbs in the River Thames in July 1912. Weight 5lbs 5oz and 5lb 3ozs. Hobbs was born in New Street, Henley in 1871 and lived in Henley all his life. Whilst working as an architect for Brakspear brewery in the 1930's he was responsible for designing many local pubs. Hobbs claimed to have caught almost 900 Thames Trout, each over 3 lbs in weight, in 55 years of fishing. He fished in the non-tidal reaches of the Thames. TENCH Latin Name - Tinca tinca Colour - Tench have a dark back with dark greyish green sides. The belly is a pale green colour usually with an orange tint which is stronger on the males during spawning. Size - Its average weight is 2kg (4lb) and grows to 20-30cm (8-12in). Characteristics - The tench is a member of the carp family. All the fins are dark, its scales are small and the iris of its eye is red. 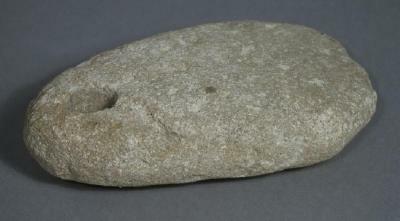 It has one small barbel at each side of the mouth. The fish uses its barbels to search by taste for food. Diet - It feeds on worms, molluscs and the larvae of insects. Younger fish eat algae but plant food forms only a small part of the diet of an adult. Habitat - Tench prefer still, muddy and slow flowing rivers and are tolerant of low oxygen levels. How fished for - Anglers use a variety of baits such as bread paste and maggots. The techniques used to fish for tench are float fishing and ledgering (when a lead weight is used to keep the bait near to the bottom of the water). Interesting Facts - In a severe winter tench can bury themselves in the mud and hibernate until the temperatures improve. 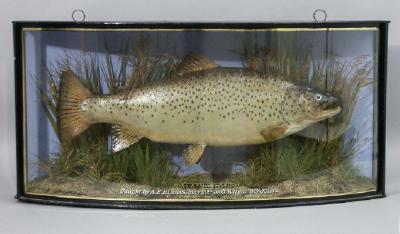 Preserved and cased Thames Trout fish, caught by AE Hobbs in the River Thames on the 30th May 1905. Weight 9 lbs 10.5oz. Hobbs was born in New Street, Henley in 1871 and lived in Henley all his life. Whilst working as an architect for Brakspear brewery in the 1930's he was responsible for designing many local pubs. Hobbs claimed to have caught almost 900 Thames Trout, each over 3 lbs in weight, in 55 years of fishing. He fished in the non-tidal reaches of the Thames. BROWN TROUT (When found in the Thames these are called Thames Trout) Latin name - Salmo trutta Colour - It is usually brownish or greenish with a darker back but the colour is variable. Greyish blue specimens occur and some are almost black. Size - Growth is dependent on the surroundings and adults are often between 20-50m long. Trout can grow up to 140cm (55ins) long. Charcteristics - The trout has many black spots on its head and body and some red spots. Its lower jaw is long and in old males becomes hooked. The younger trout are called parr and have around 10 marks (called parr marks) on each side of the body. Habitat - The trout likes clean rivers which are high in oxygen. Diet - It feeds on invertebrates, fish and crustaceans. How fished for - Trout are today more often caught from stocked lakes than rivers such as the Thames. Preserved and cased Tench, caught by T. Plat in the River Thames at Black Bridge 4lbs 2oz Preserved and cased by J. Cooper & Sons of London. 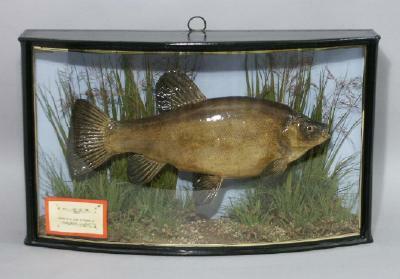 TENCH Latin name - Tinca tinca Colour - Tench have a dark back with dark greyish green sides. The belly is a pale green colour usually with an orange tint which is stronger on the males during spawning (egg production). Size - Its average weight is 2 kg (4lbs) and grows to 20 - 30 cm (8 - 12 ins). Characteristics - The tench is a member of the carp family. All the fins are dark, its scales are small and the iris of the eye is red. It has one small barbel at each side of the mouth. The fish uses its barbels to search by taste for food. Diet - It feeds on worms, molluscs and the larvae of insects. Younger fish eat algae but plant food form only a small part of the diet of an adult. 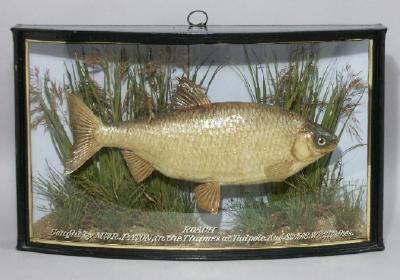 Habitat - Tench prefere still, muddy and slow flowing rivers and are tolerant of low oxygen levels . How fished for - Anglers use a variety of baits such as bread paste abd maggots. The technique used to fish for tench are float fishing and ledgering (when a lead weight is used to keep the bait near the bottom of the water). Interesting facts - In severe winter tench can bury themselves in the mud and hibernate until the temperatures improve.